My father is finally home! (even for just two months). He will back again to Riyadh on the 16th of January but we are still happy thinking that we will celebrate Christmas and New Year together! He is going back go the Kingdom of Saudi Arabia to finish his last one year contract and I told him that he can rest after finishing it. He is already 50 and I want to him to relax, maybe we could just put up a small business here and I'm giving him the planning strategy for that. He arrived the day after my mother's 50th birthday. 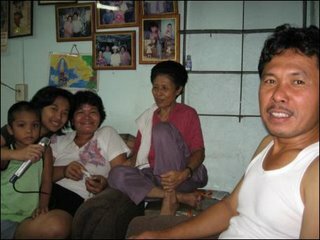 We are planning to visit our relatives in Cebu on the 14th of December. Grabe ang hirap magpabook ng ganitong season! But fortunately my sister found a travel agency that booked us to Philippine Airlines in a cheap price. Whew!